Many foods can be smoked, and it is a great way to prepare fresh mackerel which are so plentiful in the summer. 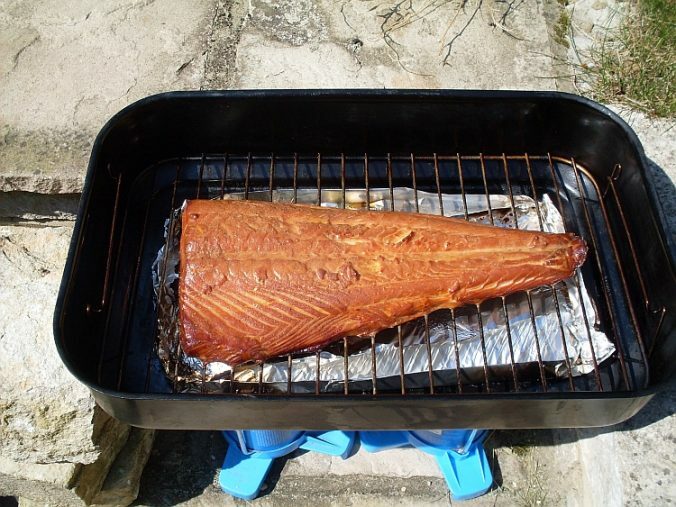 Cold-smoking involves smoking fish for many hours at a low temperature, and this preserves the food. Traditional smoked salmon you buy in a shop is cold smoked. Hot smoking cooks rather than preserves fish as it is smoked at a higher temperature for a much shorter time, so hot smoked fish must either be refrigerated and eaten within a few days, or frozen. You will also need some methylated spirits, matches, hardwood sawdust (smoke dust, available cheaply from the same shops that sell smokers), and something to cook! Fish taste much better if soaked in seasoned brine for 30 minutes or so beforehand, then dried with a paper towel. See the recipes page for a good brine recipe. You need to do this outside, so find a sheltered place preferably with a paving slab you can use as your base. Place the baking sheet over baking tray to act as a lid, and weight down with the fifth brick. Half fill the empty cans with meths. Depending on the size of the roasting tin, you may need two or three. Put the cans under the roasting tin, and light them. Cook for approximately 20 minutes or whatever your recipe advises. If the lighted meths runs out too soon, refill and relight with care. Make sure there is no chance the bottle of meths could ignite while you are refilling. A word on sawdust: this makes a big difference to the taste of the smoked food. Avoid pine sawdust, or sawdust contaminated with paint or preservatives. It is worth paying for smoke dust – only £2 or £3 – it will last for many smokings and you can get oak, hickory, maple or other flavoured sawdust that would be difficult to find from any other source. You can buy sawdust for smoking from a tackle shop that stocks smokers, or specialist barbeque shops.